Trisomy 21. A child could receive three copies of chromosome 21, and normally a human should only receive two copies, in all cells. During the development of the sperm or egg cell, an unusual cell division occurred. What gene or chromosome is affected by this disorder? 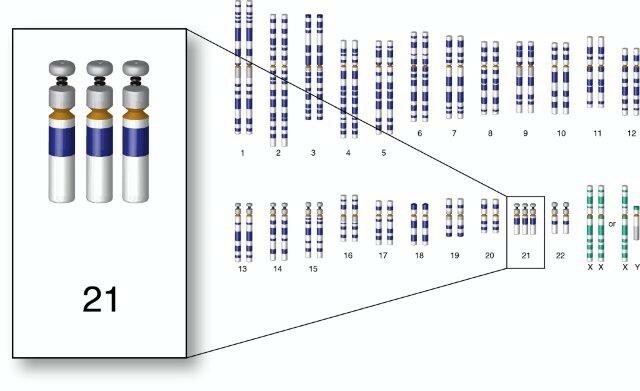 Chromosome 21 is affected by Down syndrome. It can be copied more than necessary or part of it could be involved in translocation. Are there parental tests for this disorder? During the pregnancy, women can have a screening tests. Ultrasound scans and blood tests can be ran. Ultrasounds are scans that are performed that measures the fluid collection developing under the skin at the back of the fetus' neck. A higher amount of fluid is more common with Down syndrome. Blood tests can show the levels of pregnancy-associated plasma protein A, beta human chorionic gonadotrophin, and alpha-fetoprotein, which all tend to be affected if the fetus has Down syndrome. Over 400,000 people have Down syndrome in the US. 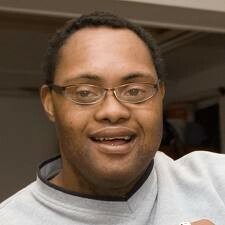 Down syndrome can occur in every race. About 80% of babies with Down syndrome are born from women younger than 35 years old. Can anyone be a candidate for down syndrome? Everyone can be a candidate for Down syndrome because Down syndrome can occur in every type of race and economic levels. Typically Down syndrome is not inherited, it randomly occurs due to an error during the development of a sperm or egg cell. It's possible that parents can pass genes that make it more likely for their children's kids to have Down syndrome. What kind of medical assistance will the affected child need? Those with Down syndrome are more likely to have certain medical problems. Medications could be used to treat specific conditions that may occur in people with Down syndrome. Surgical treatments may be needed for some medical conditions, such as heart surgeries and intestinal surgeries. Other medical treatments that can be accommodated with Down syndrome are, physical therapy and speech therapy. These are known as "Early Intervention." Will further assistance be needed, as the child grows older? Typically assistance is needed; however, people with Down syndrome are able to live without their families in assisted living. Therapists are still needed to help them transition into a new environment and they are also needed in order to continue improving their skills. What is the long-term outlook for the child? As people with Down syndrome become older and notice their restrictions, they might feel anger, frustration, and exasperation. Some Down syndrome children are born with heart problems and certain types of cancer, if these cases are severe enough, it could lead to early death. Adults with Down syndrome also have an increased risk of dementia due to their lack of ability to perform certain tasks. Are there any treatments or cures? There are no cures for Down syndrome because it deals with problems with the chromosomes; however, treatment can control medical conditions that are associated with Down syndrome. Could this disorder have been prevented? 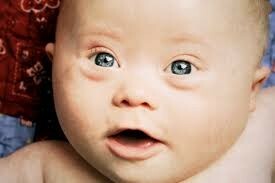 Due to the fact that Down syndrome happens due to chromosomes, there is no way to prevent Down syndrome. Can this individual have children in the future? It is uncommon that people with Down syndrome reproduce and women with trisomy 21 are fertile, however, they have a 50% risk of birthing a child with Down syndrome. Will those children be affected? What is the current status of research on this disorder? Currently, Stanford University, UC San Diego, and John Hopkins University are testing GABA, "a small neurotransmitter molecule that is responsible for inhibition within neutral circuits." Researchers at John Hopkins University are trying to find a way to restore the balance of the hippocampus and researchers at Stanford University are working with a mouse with Down syndrome and they are trying to find a way to improve it's memory capabilities. Is there a cure or new treatment coming soon? As of now, there are no cures for Down syndrome, however, treatment is crucial in order for a person with this condition to be able to perform basic tasks. Additional information about Down syndrome. Down syndrome is the most common genetic chromosomal disorder among children. There are tiny white spots on the colored part of the eye called Brushfield spots. Babies that are born with Down syndrome are typically average size, but as they get older they don't grow as fast and may remain short compared to others of the same age. Sitting, crawling, walking, and talking will occur at about double the age of children that do not have Down syndrome. There are three types of Down syndrome: Trisomy 21, Mosaic Down syndrome, and Translocation Down syndrome. 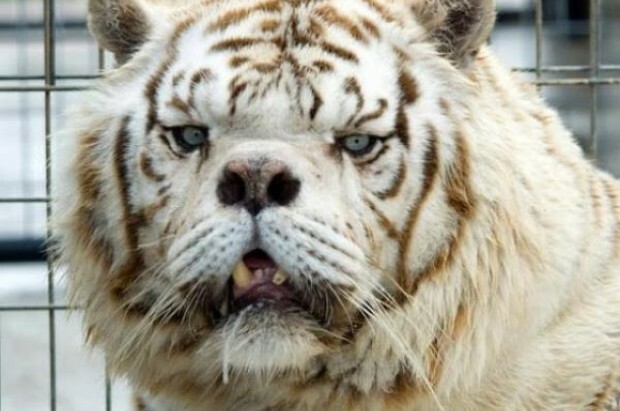 Down syndrome may also occur in animals. Chromosome 21 has three copies of the chromosomes when in normal cases there would only be two. 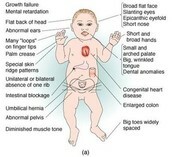 Image that shows the symptoms of Down syndrome. Many physical characteristics that are very explicit are symptoms of Down syndrome. The symptoms of Down syndrome can be seen. Pruthi, Sandhya. "Down Syndrome." Causes. N.p., n.d. Web. 30 Apr. 2015. Kenny, Tim, and Collin Tidy. "Prenatal Screening and Diagnosis of Down's Syndrome | Health | Patient.co.uk." Patient.co.uk. N.p., 18 Oct. 2013. Web. 30 Apr. 2015. Stickler, Tracy. "Down Syndrome." Healthline. N.p., n.d. Web. 30 Apr. 2015. Taishoff, Robert P. "Down Syndrome Facts." - National Down Syndrome Society. N.p., n.d. Web. 30 Apr. 2015. Sharp, Katie. "Understanding Genetics." Understanding Genetics. Science Education Partnership Award (SEPA) from the NCRR, NIH, n.d. Web. 30 Apr. 2015. Fergus, Kathleen. "Treatment Options and Therapies for Down Syndrome." About Health. American Academy of Pediactrics Policy Statement, 10 Dec. 2014. Web. 30 Apr. 2015. Kaneshiro, Neil K. "Down Syndrome: MedlinePlus Medical Encyclopedia." U.S National Library of Medicine. U.S. National Library of Medicine, 10 May 2013. Web. 30 Apr. 2015. Schoenstadt, Arthur. "Treatment for Down Syndrome." EMedTV: Health Information Brought To Life. N.p., 27 Sept. 2013. Web. 30 Apr. 2015. Bhargava, Hansa D. "Down Syndrome Tests, Diagnosis, and Treatments." WebMD. WebMD, n.d. Web. 30 Apr. 2015.